Communicating requirements visually is a very effective way of interacting with stakeholders. However, if you’re not a designer, creating beautiful visual diagrams, charts, plans, and maps can seem like a challenge. Luckily, we have tools like Lucidchart, that make it simple to communicate with stakeholders using easy-to-use tools and pre-designed templates. Unlike Microsoft Visio, Lucidchart is a browser-based application, although you can download a mobile version and install it on your Android or iOS device. Because the app resides in the cloud, you can access it from anywhere at any time and from any device. Once you’re logged in, select either one of Lucidchart’s pre-made templates or start from scratch with a blank canvas. It took me just a few minutes to figure out how to use the app, and I was pleasantly surprised at its speed. Adding, moving, rotating, and resizing objects felt easy and natural. What counts the most is the ability to draw models. With Lucidchart, you get an entire category of icons just for modelling. It includes use case diagrams, SIPOC diagrams, sequence diagrams, ERD diagrams, and many others. Apart from these, Lucidchart also includes extremely handy mockups for Android/iOS apps, wireframes, organizational charts and trees, to name a few examples. Each template contains a library with various shapes and objects that allow you to quickly populate any canvas of your choice without having to draw anything by hand. You can also import Amazon Web Service (AWS) Architecture, Gliffy, Omnigraffle, and Visio files. When you’re finished, you can either export your creation to JPEG, PDF, PNG, SVG, or VDX file files or let Lucidchart automatically turn it into a presentation. 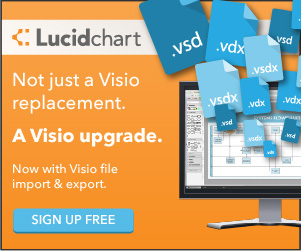 Lucidchart improves the standard diagramming experience that you may know from Microsoft Visio and other similar software solutions in several key ways. You can collaborate with co-workers in real time and discuss issues in the integrated chat box. What’s more, Lucidchart integrates extremely well with Google Drive, allowing you to safely store and share your documents. Apart from Google Drive, Lucidchart also supports many other third-party services, including Confluence, JIRA, Jive, SAML, SCIM, Slack, HipChat, and G Suite. I’ve really enjoyed using Lucidchart and would recommend that you explore it. Lucidchart can be used (with limitations) for free.